There’s a video that I’ve watched three or four times now because what the woman says in it rings so true it’s like a thousand bells start clanging in my head when she starts to speak, saying take notice. You’ve maybe already watched it because this Ted talk on vulnerability by Brene Brown has been watched by over four million people, so you may well be one of them. Yesterday, I found out via Sarah’s blog, that there is a follow up talk now on Ted’s website, and so I got comfortable and watched again and the bells started ringing all over again. Brene talks about vulnerability and how vulnerability feels like weakness, but it looks like courage. A few days ago someone who reads my blog described my life as a “fairytale” and I immediately laughed out loud and then stopped in astonishment when I realised she wasn’t kidding. Does she have the right blog? I wondered. But here’s the thing about that – she’s not wrong. Have you read any of the original fairy tales? I’m not thinking of the Disneyfied versions with their pastel colours and sing-song voices. The fairy tales from H.C.Anderson and Grimms Brothers. Goodness, they are dark. These are stories with a moral for sure, and sometimes a happy ending, but a lot of tests and hardships and unfairness in the middle. I think we remember the happy endings more than the difficult beginnings. We forget that Hansel and Gretel get lost in a scary wood without their parents, and remember only that they pushed the wicked child-eating witch into her own bread oven. We forget that Snow White had become an orphan and fled in fear of her life from an evil stepmother, and remember only the Prince’s waking kiss. We forget that Princess Fiona had been trapped in a high tower because of the terrible curse on her, and remember only Shrek and Donkey’s heroics to get her out… wait, ok, not such a traditional fairytale. But still. Fairytales are maybe so attractive because we see lots of characters faced with extraordinary tests persevering and standing firm and eventually gaining their freedom. 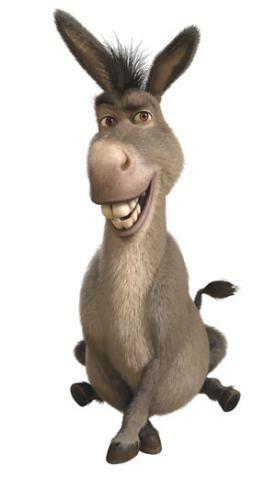 But as Donkey said, “I just know, before this is over, I’m gonna need a whole lot of serious therapy. Look at my eye twitchin”. The key is that I am still stepping forward. And all anyone around me sees is that I stepped forward. Come a little closer and you’ll see my knees knocking and my palms sweating and my head swimming. But what feels like weakness, looks like courage. And the wonderful thing is, there is a happy ending. Only I think I am realising that it is a continuous happy ending, if you just know where to look for it. The struggles don’t end, in this life at least, but the happy endings are all around us. Maybe life is a fairytale after all. Previous post Happy Birthday to my little sister!